Handle scales made of olive wood. This type of wood has excellent properties and has therefore been regarded as a valuable material for many centuries due to its warm colouring and the honey-coloured grain of the wood. 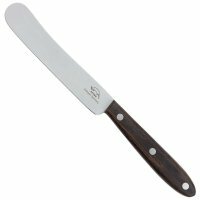 Whether at the breakfast table or on a picnic - this typically shaped table knife called a »Buckelsmesser« (Buckel = hunchback) has proven itself for over 140 years and has become a classic. 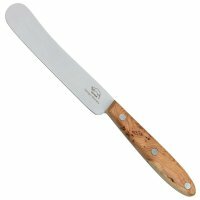 This knife is suitable for cutting bread, cheese and sausage, plus its wide blade can be used to thinly spread butter or other spreads. The special shape of the blade is characteristic of the traditional, old German table knife. The spine of the blade is slightly curved and instead of a point, the front of the blade is quite round. 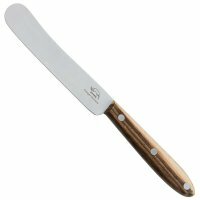 The handle scales are mounted on the full-length tang and triple-riveted. Rustproof steel No. 1.4034, double-bevelled, hardness 56 HRC.